We make bathing safer by installing an Easy Step® into your existing tub - making it a walk-in shower. Reduce the danger of slipping and falling with our safety options. Easy Step - Step through, not over! Shown with optional refinishing of tub and tile. Slip and fall accidents are a concern among those with limited mobility. The Easy-Step is a cost effective option that turns your tub into a walk-in shower - in just one day! 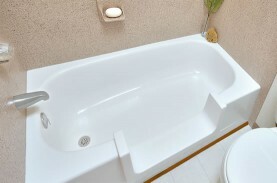 You save thousands over the cost of a walk-in tub. Additionally, the process is reversible if the cut out is saved. 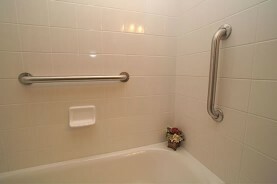 For added safety Miracle Method can provide and install grab bars, curved shower rods and hand-held shower nozzles. These are must have items for seniors living at home or anyone who has limited mobility. 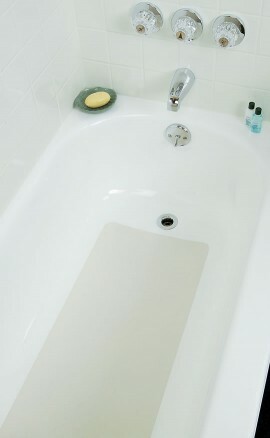 Miracle Method can apply a bonded slip resistant surface to your bathtub or shower pan. This option will not peel and helps reduce the risk of slip and fall accidents.